We are beyond pleased with the patio the Haijoe team installed! Elder explained our options and exactly what they would do and how stamped concrete is laid, holds up, and how to care for it. We were able to spend what we could afford and not unnecessarily splurge on flagstone for a small townhome patio. The Haijoe team came in and transformed our backyard in one day. Our project had been delayed due to HOA approval and rainy weather. They made sure we were worked into their very busy schedule, and the guys worked incredibly hard. The team is a well oiled machine and my kids, my husband and I found ourselves watching them out the window, in awe of the work they were doing quickly and seamlessly. The end product is something we have and will use almost daily in the warmer months. What's more is Elder is a lovely, trustworthy family man and small business owner. We were so happy to have found him and his team. 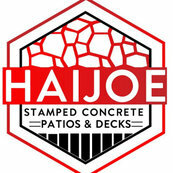 Should we move into a larger home and need more work done we will absolutely call Haijoe.